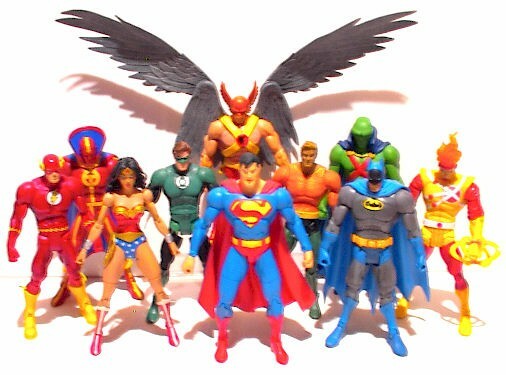 One of the greatest action figure toy lines ever made was first produced in 2002. 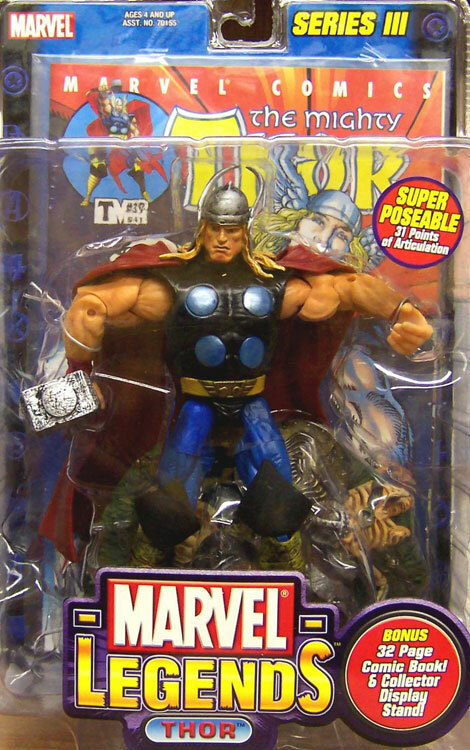 Marvel Legends figures are still produced today after having been re-launched in 2012 by Hasbro. 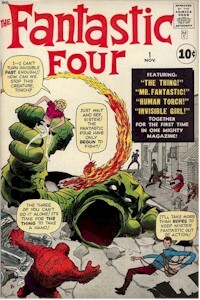 Marvel Comics has produced a plethora of characters since its existence dating back to 1939 when they were known as Timely Comics and when they made their re-emergence in 1961 at the onset of the Marvel Age of Comics with Fantastic Four #1. 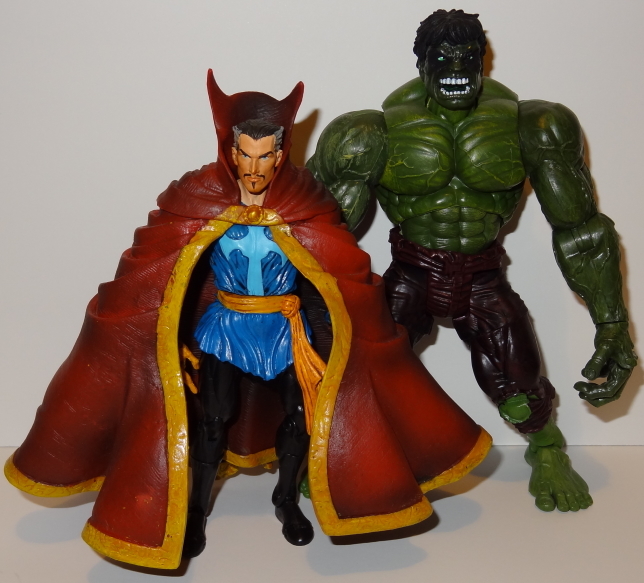 Toy Biz would tap into the Marvel Universe to produce some of the best action figures around. 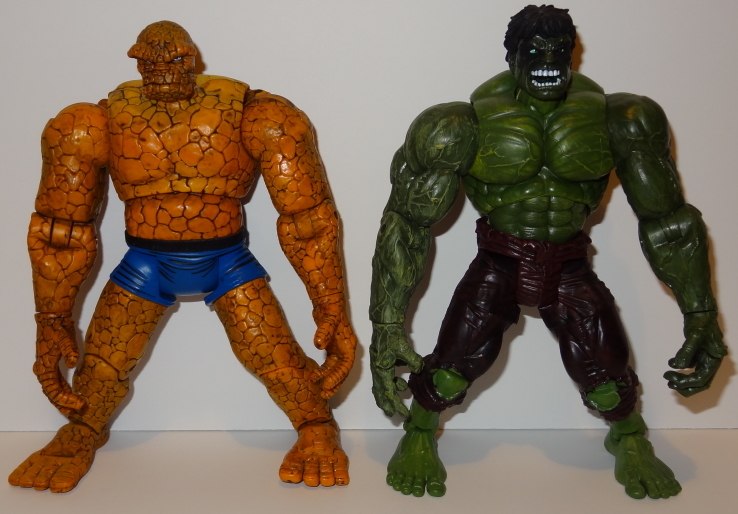 Prior to 2002 most action figures made were in the long-running, more accepted 3-3/4 and 4 to 5 inch category with only a handful of figures manufactured in a larger scale. Toy Biz would introduce a new line of Spider-Man figures in a 6 inch scale in 2001 which was the predecessor to the Legends product line. The Spider-Man line contained Spider-Man, Daredevil and some of Spidey’s villains in a large clear plastic encased container which included a relevant diorama background and comic book for that particular character. There was also a card back which would list the characters mini-biography and photos of other figures in that series. Up to that time most action figures consisted of only a few points of articulated movement primarily the head, arms and legs. This new line offered a great deal of moving parts allowing buyers and collectors to pose their figures in so many different ways and not limiting the figures to the traditional stiff look. Spider-Man and Daredevil had over 25 moving parts allowing fans great play with the figures. This paved the way for many product lines by Toy Biz and other companies to create multiple points of articulation in the action figures to follow. 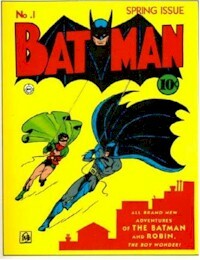 The product was well received with buyers and collectors and ran for two series setting the stage for the Legends line using the exact same format and packaging with similar contents-diorama base, comic book and card back profile. 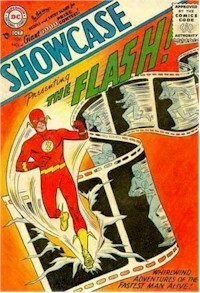 Some figures would include a foil print sheet in place of the comic offering buyers a special collector's item to try and track down for their collections. 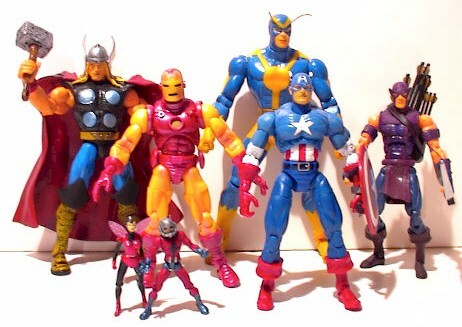 In the Marvel Legends line you can adjust the head, middle chest, waist arms-at a couple of points, elbows, wrists, fingers on some figures, legs-at a couple of points, knees, ankles and toes. 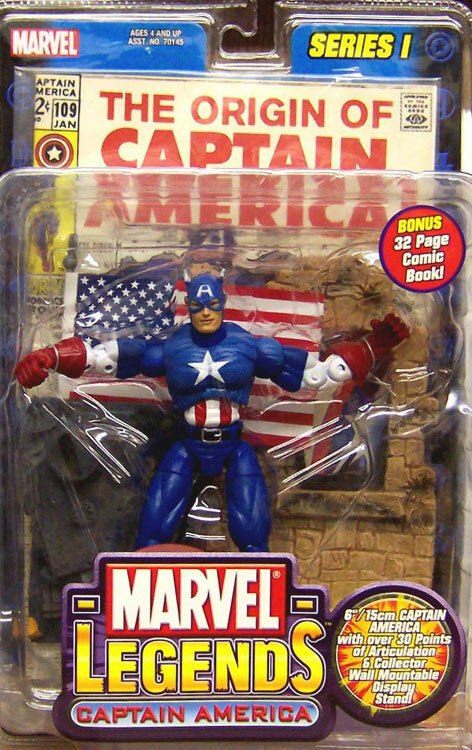 Captain America, Hulk, Iron Man and Toad made up the very first Marvel Legends series and was a success with collectors. The range and depth of figures and the size of the figures that Toy Biz created for the Legends line have been tremendous throughout the years. They’ve produced a lot of other well-known characters like Wolverine, the Thing, various Iron Mans, additional Captain Americas, various Hulks, Thor, Ghost Rider, Black Widow, Hawkeye, Dr. Strange, Black Panther, Colossus, Professor X, Apocalypse, Iron Fist as well as some not so well known like X-23 and Deathlok. Depending on the character they would stand in the 6 inch range typically, but could be in all sorts of sizes and shapes to represent the characters exactly. The largest figure in the Marvel Legends line was Galactus standing over 14 inches tall. A fan vote in the action figure magazine Wizard Toy Fare proclaimed it the best figure ever made. It was highly detailed and its ominous presence made anyone’s collection standout for the better. The paint jobs have been very consistent from figure to figure in this line. There are some very, very good paint applications on a good majority of the figures. The sculpting has been incredible giving each figure great detail. The packaging is very uniform throughout most of the line when Toy Biz produced them. They all came in the clear plastic encased container from the beginning through Series 16 of Toy Biz’ run. 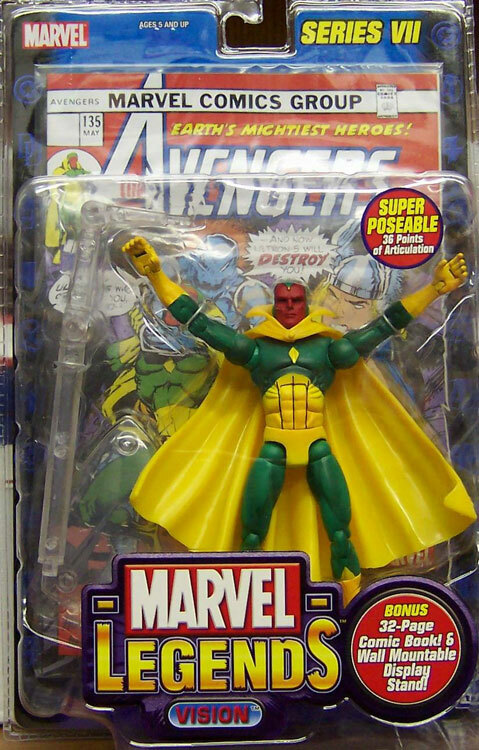 Hasbro took over in late 2006 as they had acquired the license to produce Marvel characters into action figures and toys and would change up the packaging style to a traditional clear plastic bubble attached to a card back. They eliminated the diorama accessory and comic book in the process which left a lot of collectors wondering why. It became obvious it was due to financial reasons for this move. When you display these unopened package figures next to one another they look very uniform and can freely stand without tilting the package backward or forward. Typically each series in this line contains between 4 to 9 figures. There have been special figures and multi-pack figures of 2 or more that have been produced which were store, internet and comic book show exclusives. In addition since the start Toy Biz had added in each series variation figures whereby some of the characters would be produced differently making two or more figures of a given character for collectors to track down. It could be a small cosmetic change like an angry face version of Daredevil villain-Bullseye with his non-angry face version as the regular rendition or a complete repaint like that of the Ghost Rider who came in black outfit with regular painted motorcycle and in a blue outfit with an orange painted motorcycle. This has further increased the overall total figures in the line and have given collectors a whole new avenue of figures to chase after. Originating in Series 9 Toy Biz created the Build a Figure concept within a series. 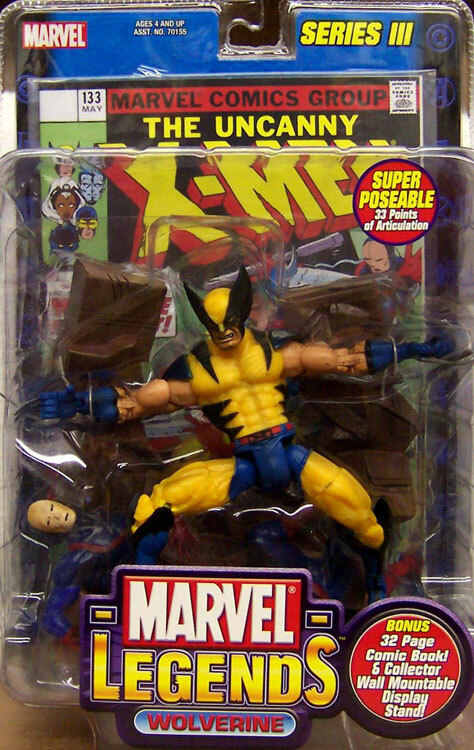 Toy Biz developed the idea of including a body part to create an additional exclusive figure to that series and placed one part in each of figures in that series packaging. This was where the Galactus figure was introduced. There were essentially 7 figures that one had to purchase in order to complete the construction of this figure. There were 2 variant figures in this series so if you were a completist you would want all 9 figures, but it was not necessary to assemble Galactus. Subsequent Build a Figures consisted the likes of the Sentinel, Giant Man, Apocalypse, Blob, Fin Fang Foom, Ronan, Nemesis, Ares, Red Hulk, Brood. It’s been great fun for us collectors to collect the entire series and construct the Build a Figure. 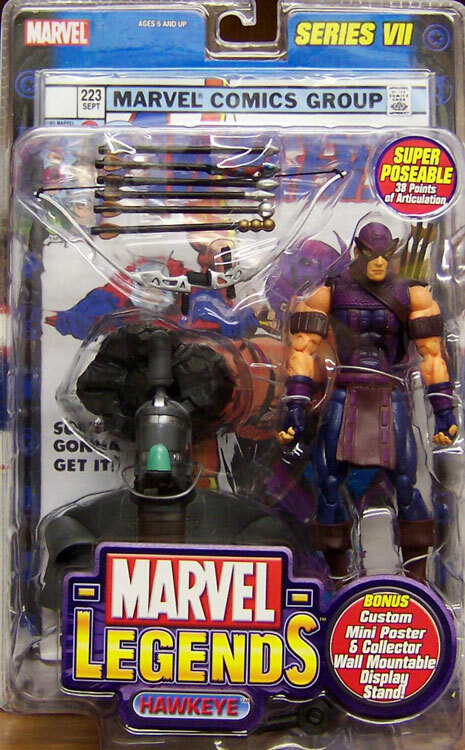 Both Toy Biz and Hasbro have produced exclusive Marvel Legends figures which were only found at select retailers like Toys R Us, Walmart and other venues. These were created as spin-offs and have produced their share of collector enthusiasm. Toy Biz and Hasbro have created Spider-Man vs the Sinister 6 box set consisting of Spidey, Black Cat, Doctor Octopus, Electro, Green Goblin, Kraven the Hunter, Venom, Monsters Gift Pack including Dracula, Frankenstein, Werewolf by Night, Living Zombie, House of M Gift Set consisting of House of M versions of the Hulk, Iron Man, Thing and Torch, Young Avengers Gift pack, specialty 2 packs of Hulk and Valkyrie, Kree and Skrull, Ultimate Captain America and Ultimate Nick Fury and others. There were the Face-Off series that featured 2 packs of a hero vs. villain including Captain America and Red Skull, Hulk and Leader, Wolverine and Sabretooth, Punisher and Jigsaw, Daredevil and Kingpin, Iron Man and Mandarin. It’s been incredible for any collector to search and acquire pieces in this fantastic line. You can go in any direction with these figures. Some collectors focus in on the more well-known figures while some go after the variants. 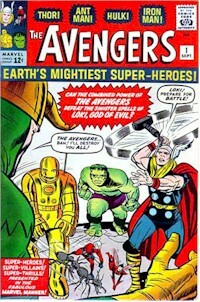 Some like to collect the Build a Figures or assemble the teams like the Avengers, Fantastic Four, X-Men. There’s no real shortage of figures to collect here. 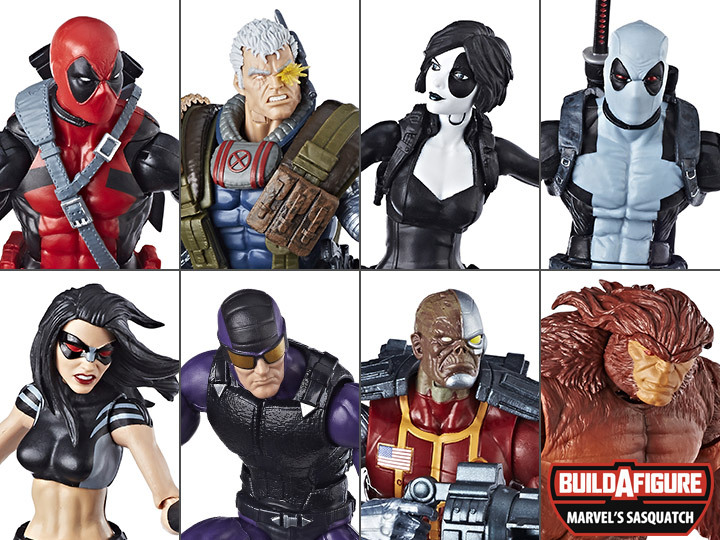 The Marvel Legends line is very comparable to the DC Universe Classics line as well as many other 6 inch scale figures which adds to the almost endless possibilities to your collections. Initially Toys R Us was the only retailer offering new Marvel Legends figures however that is changing as Hasbro re-launched the entire line again to run concurrently with their Marvel Universe line. You'll find the figures at Target and Wal-Mart and other regional stores that carry action figures. There were some Toys R Us stores that still have on their shelves 2 packs of Hasbro's Legends figures from a couple of years ago like Iron Man and Sharon Carter, Dum Dum Dugan and Hand Ninja, Invisible Woman and Human Torch, Nick Fury and Hand Ninja. Examining the above retailers' web sites may yield the newer ones while Amazon.com’s web site will offer you new and old figures. 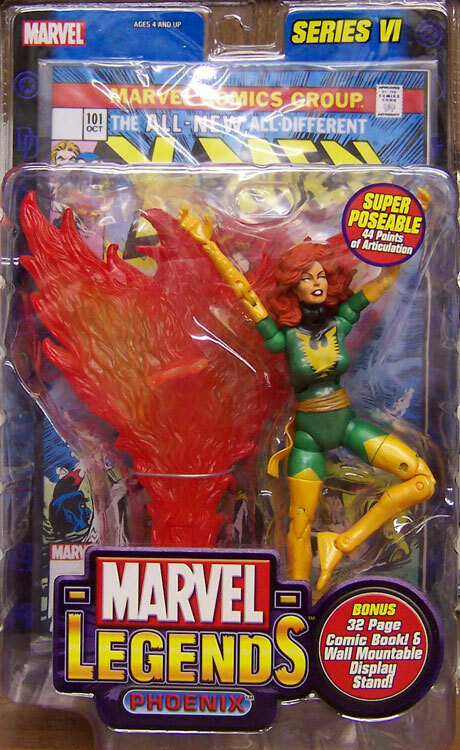 I have created this page with direct links to just about every Marvel Legends figure ever made that are available for sale on Amazon.com's site. I also included many of the other Marvel 6 inch line of X-Men, X-Men movie, Fantastic Four, Hulk, Iron Man, Spider-Man figures that fit in well with the Marvel Legends line. My preferred choice for past figures is typically Ebay. There’s a lot of collectors / sellers / dealers always looking to move in and out of product and Marvel Legends is a product line that they know will sell for them since so many collectors want them. Amazon.com however is a little more consistent than Ebay since they focus on e-Stores and sellers there tend to keep their listings running until inventory is depleted and therefore the links are going to keep running longer. On Ebay sellers primarily focus on auctions which typically run for 7 days or 10 days and then end. It's really hard to keep direct links on my site for items that do not run consistently. Some sellers do run listings on Ebay that refresh every 30 days and start all over again so it's not impossible for you to individually keep track via their watch list feature and view what you've been watching in your My Ebay page. In any regard I try to acquire these figures in lots or sets. It's more economical this way since you're paying a price per each figure at less than you would pay for them one by one. Shipping costs can be pricey buying them one by one as well. It's really your choice on which figures you want to go after as you may not want everything in a given lot or set. Be careful to check out any listings carefully on either of those sites. Some sellers’ terms are not right for everyone and sometimes the items are not what you expect. If condition of the package is important to you, then be sure to ask a lot of questions. If you don’t get the right kinds of answers you’re looking for, then move on and try another listing. Always check out the seller’s profile to see how their past selling has been. If they’re new to selling and have only been buying, ask questions. You always want to be comfortable with the person you’re potentially going to be buying from and you really need to know what it is you’re getting.